Development of a New Computer Aided Diagnosis System to Detect Lymph Nodes in the Abdomen: Further Utility for Sentinel-node Navigated Laparoscopic Surgery in Gastrointestinal Cancers and Its Education. Introduction: Preoperative imaging is highly useful to make a planning of operation and preoperative simulation. Recently, sentinel-node navigated surgery has been advocated in gastrectomy for gastric cancer to minimize surgical stress without curability. Little has been reported about computer aided diagnosis system (CADS) to detect lymph nodes (LNs). We herein introduce our new CADS. 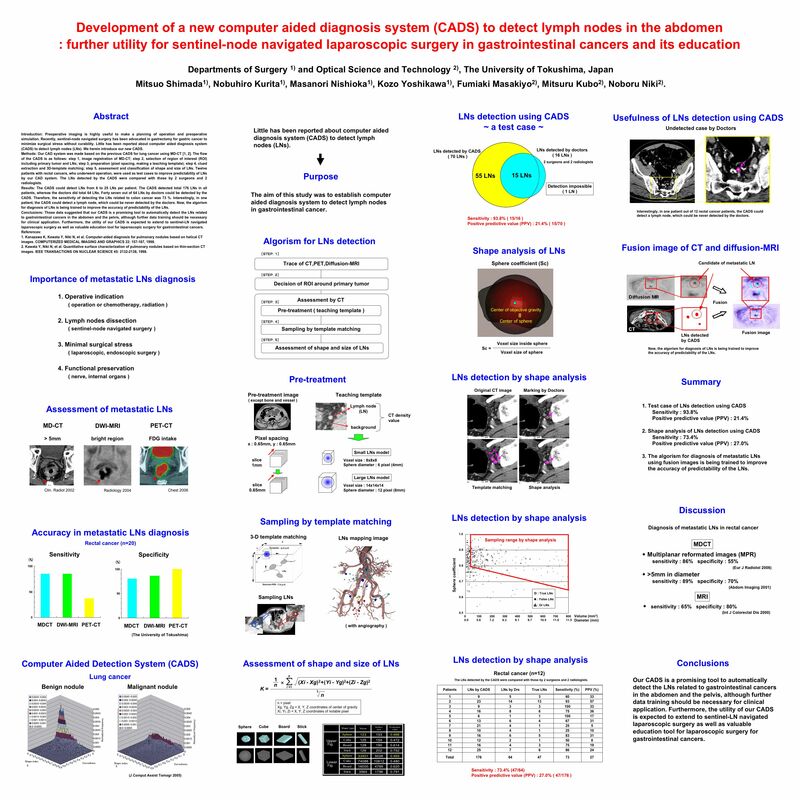 Methods: Our CAD system was made based on the previous CADS for lung cancer using MD-CT [1,2]. The flow of the CADS is as follows: step 1, image registration of MD-CT; step 2, selection of region of interest (ROI) including primary tumor and LNs; step 3, preparation (pixel spacing, making a teaching template); step 4, clued extraction and 3D-template matching; step 5, assessment and classification of shape and size of LNs. Twelve patients with rectal cancers, who underwent operation, were used as test cases to improve predictability of LNs by our CAD system. The LNs detected by the CADS were compared with those by 2 surgeons and 2 radiologists. Results: The CADS could detect LNs from 6 to 25 LNs per patient. The CADS detected total 176 LNs in all patients, whereas the doctors did total 64 LNs. Forty seven out of 64 LNs by doctors could be detected by the CADS. Therefore, the sensitivity of detecting the LNs related to colon cancer was 73 %. Interestingly, in one patient, the CADS could detect a lymph node, which could be never detected by the doctors. Now, the algorism for diagnosis of LNs is being trained to improve the accuracy of predictability of the LNs. Conclusions: Those data suggested that our CADS is a promising tool to automatically detect the LNs related to gasatrointesnal cancers in the abdomen and the pelvis, although further data training should be necessary for clinical application. Furthermore, the utility of our CADS is expected to extend to sentinel-LN navigated laparoscopic surgery as well as valuable education tool for laparoscopic surgery for gastrointestinal cancers. 1. Kanazawa K, Kawata Y, Niki N, et al. Computer-aided diagnosis for pulmonary nodules based on helical CT images. COMPUTERIZED MEDICAL IMAGING AND GRAPHICS 22: 157-167, 1998. 2. Kawata Y, Niki N, et al. Quantitative surface characterization of pulmonary nodules based on thin-section CT images. IEEE TRANSACTIONS ON NUCLEAR SCIENCE 45: 2132-2138, 1998.